Over 20 militant attacks have been registered since the midnight. 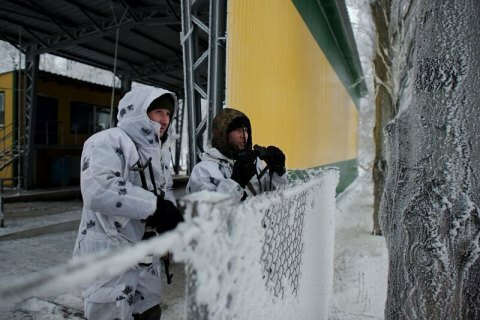 Ukrainian serviceman was killed and two wounded in combat in the antiterrorist operation (ATO) area in Donbas on 10 January, the ATO HQ said in its evening update. It registered 26 attacks by pro-Russian militants from the midnight to 1800 Kyiv time. In the Mariupol sector, the militants fired with mortars on Talakivka, grenade launchers of various calibres on Maryinka, Vodyane, Talakivka and Shyrokyne, and with small arms in Pavlopil and Novotroyitske. A sniper was operating near Novotroyitske. In the Luhansk sector, they targeted Novozvanivka with mortars and anti-tank missile systems. In the Donetsk sector, they fired with mortars of various calibres on Avdiyivka, Kruta Balka, Opytne and Zaytseve. The enemy used an infantry fighting vehicle to target Opytne. As reported earlier, five Ukrainian servicemen were wounded in Donbas on 9 January.